Singapore Business TimesDuring next week's International Monetary Fund (IMF)-World Bank annual general meeting, issues of money, globalisation and funding - among others - will be in the air and on the table. We look at how some of these issues are represented in - or have affected - the artistic events happening in the city during the period. Usually, Art and Money form an unholy alliance - whether as the obscene amounts paid in auctions for the works of deceased artists or as the negligible amounts earned by living artists. But, sometimes, the alliance transcends its boundaries to become something else altogether - when money is the actual raw material for art. The niche practice was made famous by artists such as Fiona Hall - who shredded dollar bills to create fragile, woven birds' nests - or JSG Boggs - who meticulously drew one-sided US dollar notes that he exchanged for goods worth the denomination of the note. Examples of this sort of play with money-art in the ongoing Singapore Biennale are made more subversive, thanks to the timing. For our Biennale cannot be seen as just site-specific - it is time-specific as well. Its juxtaposition with the IMF/World Bank meetings offers a specially legitimate prism with which to view artworks dealing with forms of money or currency. There are interesting slippages; Biennale curator Sharmini Pereira points out, for example, that currency loses its 'value' when rendered as art, yet the act creates something with a value of its own. Money is also part of our visual culture. Ms Pereira talks of 'the iconography of state and religion' present on the bank notes of a country, which artist and magician Jonathan Allen exploits so well. For his Singapore performance, he printed large quantities of one dollar bills emblazoned with his alter ego Tommy Angel. Over the past few days, he has been 'put-pocketing' these dollar notes into the pockets and bags of unsuspecting Singaporeans. He has 'placed' around 1,500 such notes already, and has assistants who will continue the work even after he leaves. 'Magicians understand our psychological connection with money,' he says. For money has a potent role as a prop in magic, and viewers are particularly goggle-eyed when magicians 'materialise' money as the proverbial rabbit from a hat. Allen's sleight-of-hand distribution of bank notes is also suggestive of the way in which ideas - and especially the more sinister theologies - are put into circulation among people. Tommy Angel himself was created post-9/11 as a way to put a face to the more negative aspects of emerging Christian fundamentalism; he is a Billy Graham meets David Copperfield via Donald Rumsfeld sort of character. Talk to Allen, and he takes you on a 'magical' trip through the history of the magic arts via the history of gospel magic to his own roots in magic - a grandfather who was a metal worker and who made double-headed coins for him. Allen also dispenses related trivia: one of the - contested - derivations for the term 'hocus pocus' is the saying hoc est corpus ('This is the body'), spoken during the Catholic Mass. Among the other Biennale money-art artists is Jeon Joonho. In part, he plays with the power structures embedded in the US dollar notes that become the background of his video artworks The White House and In God We Trust. The latter is a phrase taken from the US dollar bill, and questions the whole business of nation building with simple devices such as people futilely asking for directions to the Independence Hall. In the more powerful White House, the artist 'white washes' out the windows on the facade of the White House as it appears in the US$20 bill. Obviously, the power of the dollar note does not lie in the value of its material - paper; interestingly enough, before 1971, the US dollar was pegged to gold at a fixed rate. The idea of money's 'value' is contested in the work of Hossein Golba: a gold ingot inscribed with the words 'Diversity is Value'. It asks the question, what is it that we value - the diversity of human life or this human invention we are obsessed with, i.e., money? The artist is planning to further commodify this work by creating 1001 copies of it for sale. Gustavo Romano has dealt with the exchange value of money in past performances of the work Time Notes. However, he altered the performance in direct response to Singapore, says Ms Pereira; the artist walked down the commercial heart of Singapore, Orchard Road, letting go of 'bank notes' - and recorded the responses that ensued. Less directly, Jennifer Wen Ma offers a certain commentary on money with her video work Alms. Alms-giving is a tenet of all religions, but you could argue that the giving of money - at any level - is a problematic act; nations and individuals often get locked into uneasy and ultimately destructive debt situations. Allen suggests a curious parallel between Money and Art when he talks of money as an abstraction that has been forced into representation. 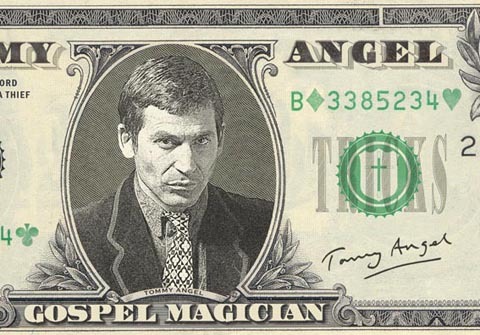 I walked away from the interview with the artist/magician not just with much to ponder about the currencies of art, magic and religion - but also with a Tommy Angel dollar bill that had been put-pocketed into my bag.